Hey there! We’re now on WhatsApp! At OYO, we deliver the best to our customers by unlocking beautiful living spaces while making sure that their experiences are always hassle-free. We are therefore delighted to announce our integration with WhatsApp for Business. In a very short time since inception, WhatsApp has emerged as one of most widely used communication channels across the world. Through WhatsApp, we will connect with you real time to ensure your hotel-booking process is convenient and easy. 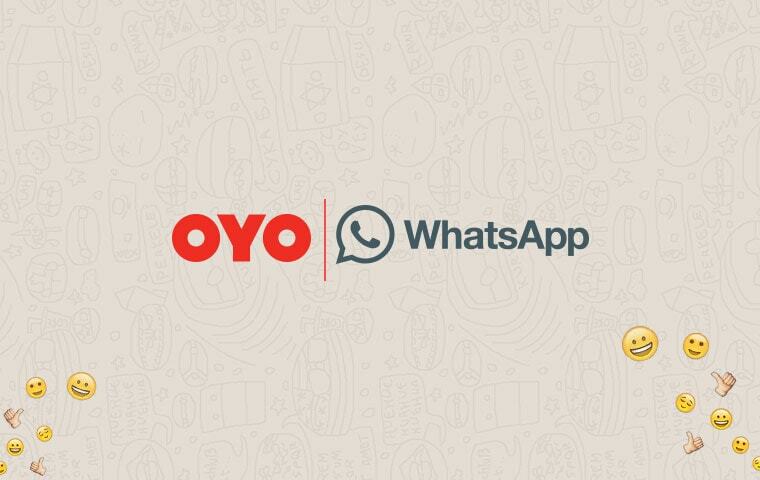 At OYO, using WhatsApp for business or customer service is not new! In the past, our teams have used the application to send hotel pictures, confirmation email screenshots if customers did not receive them by SMS, chat with the customer to answer their questions or resolve issues. In fact, our internal teams use WhatsApp as a very efficient tool for intra-organization business communication! 1) Booking Confirmation: Once you book a room with us, you’ll receive a confirmation message on WhatsApp. 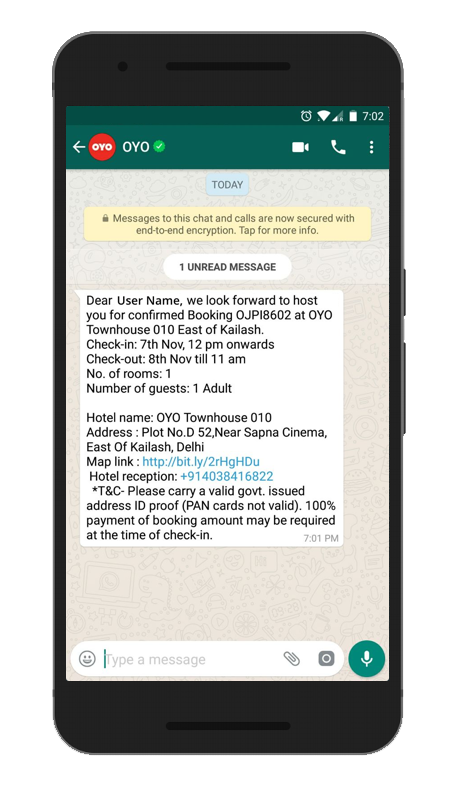 2) Reach OYO: On the day of the check-in, you’ll receive details on how to reach the hotel. 3) Cancel Booking: If you happen to cancel your booking, we will message you the cancellation details. And if you don’t have a WhatsApp account, we will notify you by SMS and email. In case of a connectivity issue, we will send you an SMS in addition to the WhatsApp message. 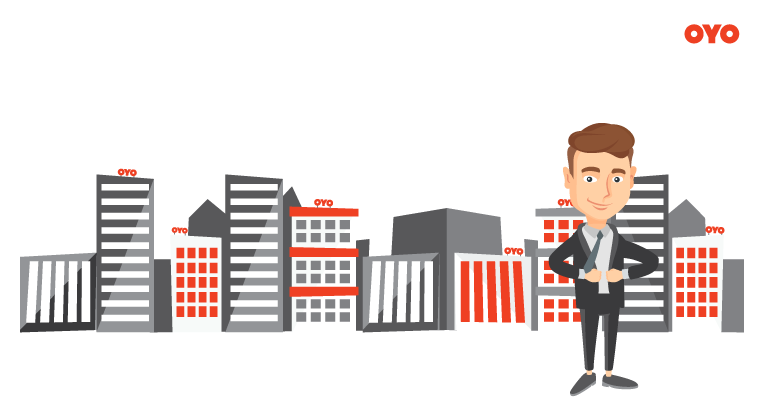 All the messages you’ll receive from us will be sent from a verified profile (Tick Mark) with corporate username OYO so that you are assured while communicating with the sender. 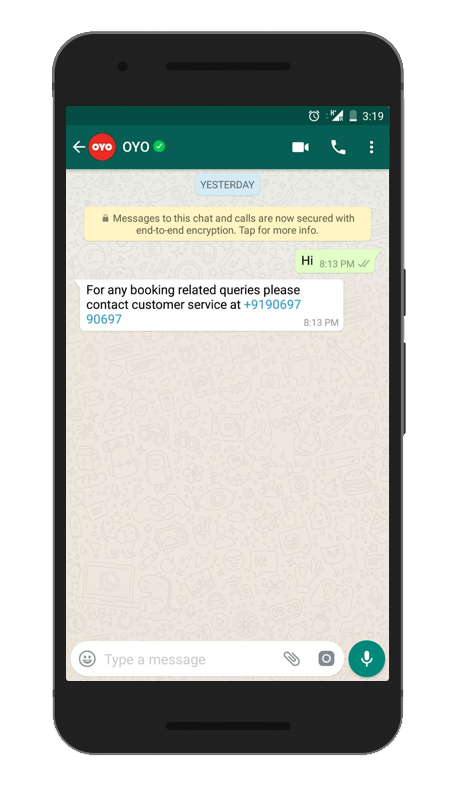 On the customer communication front, we intend to rapidly integrate solutions for responses on WhatsApp, assistance with wifi & breakfast details and booking receipt at check-out. As we roll out version 1.0, you will receive a standard reply if you respond to any of the messages. At OYO, we take guest privacy and security very seriously. 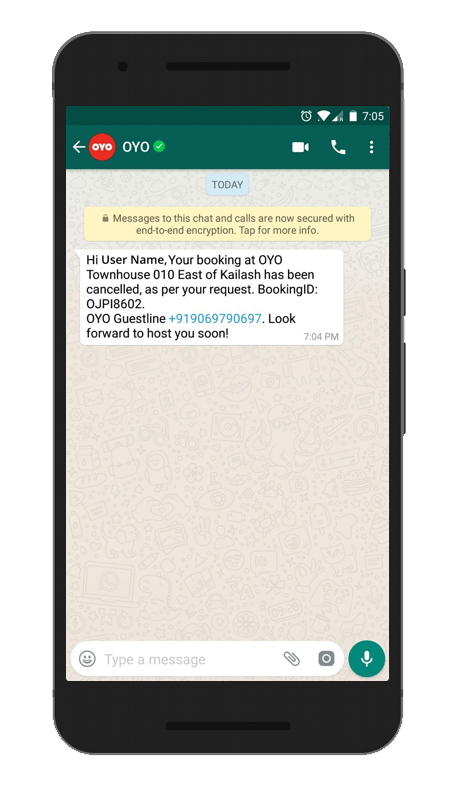 So please be assured that your details are secure with us, and only relevant information about your stay will be communicated to you through WhatsApp – the idea is to reach out to you on a medium of your choice. A new platform. A new experience. Here’s to more convenience as you experience your hassle-free OYO stay! Entrepreneurship is at the heart of OYO philosophy! We are India's largest branded network of hotels spread across 200+ cities, with 6,500+ hotels, offering standardized stay experiences at an unmatched price.